A sugar addict's sweet natured blog that enjoys all things sugar and spice and everything nice! Where to start this blog hey? Well I shall start with the first piece of candy that I reviewed specifically with starting this blog in mind! 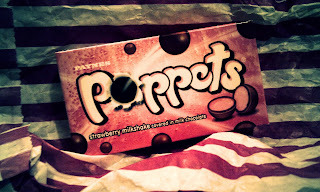 Strawberry Milkshake Poppets appealed to me purely because I grew up consuming and adoring the mint poppets and knew I had to give these a go. They come in that little box we all know so well where you push the tab in and pour the suckers out. You really could smell the sweeteness as soon as you opened the box! Were these going to be mellow creamy strawberry? Tangy berry that gets the juices going? Or so intensely sweet that they make the back teeth in your mouth shudder and after like five poppets, you have to put them down and take a break from being overwhelmed by the sugary kick these have?! These were so sweet that even me with a massive sweet tooth found them towards the end very repulsive! I'm not joking about how sweet they are, as I recall what they tasted like, my teeth are rattling in the memory and trauma of it all! Won't be in a hurry at all to be eating these! Dissappointing compared to the mint poppets so I will be resisting the little pink boxes in future! This blog was created to share the love, excitement and tasty colourful joy of all things candy and sweet related! Remember that feeling you got as a child when you were in a sweet shop? This is blog is the result of that same crazy love that grew into adult-hood except there's a whole wide world's worth of candy and sweets to enjoy! For me, Birdie (thats my name!) sweets is my number one love and nothing makes me happier than kicking back and enjoying and sampling candy by the bucket-loads! ...and you can join in here on Sugar Rush! This blog is created purely for enjoyment and consumption of sweets!. Awesome Inc. theme. Theme images by loops7. Powered by Blogger.